Veteran Kamen Rider Actors Takeru Satoh & Toshiki Kashu Return In Kamen Rider: Heisei Generations Forever! The last cinematic Kamen Rider project of the Heisei Era– Kamen Rider Heisei Generations FOREVER hits theaters this weekend and the good people at Toei have apparently decided to end things with a bang! 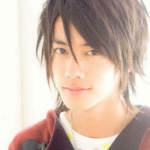 *Takeru Satoh who previously played the titular hero of Ryotaro Nogami/Kamen Rider Den-O has returned! This is Satoh’s first role in tokusatsu since leaving the role of Den-O in 2008, and many fans thought his reprisal would be unlikely due to the actors’ busy schedule. *Not to be outdone, actor Toshiki Kashu (who portrayed /Shouichi Tsugami/Kamen Rider Agito) also announced his participation in Heisei Generations Forever! This tidbit was revealed via an image on the actors’ Instagram featuring a recording booth- causing some to speculate this particular return may be voice only. Feel free to join in our Heisei Generations Forever Discussion Thread to share your thoughts about these remarkable returns! Today, Toei began streaming a new video promoting the upcoming Kamen Rider Heisei Generations Forever film (which comes out in two days!). But rather than just a new teaser or trailer for the film, this video previews the films theme song, which is itself a compilation and re-mix of the Opening Themes for all 20 Heisei Riders! Titled “Heisei Generations Forever Medley D.A. Re-Build Mix” this song arranges clips from each of the 20 Heisei Rider OP’s into one giant song, set to a variety of archival footage as well as new scenes from the soon to be released film itself. This new theme was arranged by Daisuke Asakura. 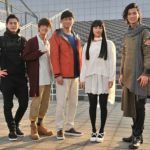 Kamen Rider Heisei Generations Forever hits Japanese theaters on December 22nd! Best to dodge spoilers on social media for a bit, but if you’d like to join in on our ongoing discussion of the film, feel free to pop into our discussion thread linked below. Just click “Discuss on the TokuNation Forums”. A brand new fighting game is coming to the Playstation 4 featuring your favorite Kamen Rider characters. 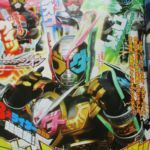 Announced and revealed today via YouTube, Kamen Rider Climax Fighters looks to feature your favorite Hesei and Show Riders including the most recent Kamen Rider Ex-Aid and even Kamen Rider Build. Check out the trailer below. For more details, check out the official site by clicking here. Bandai’s next installment of the fantastic little 66action Kamen Rider figures have been revealed today. And finally, Kamen Rider #3 from the recent Super Hero Taisen GP movie. At the moment, there’s no word on when this set will be released or for how much. 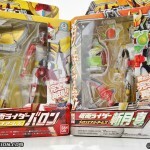 SH Figuarts & Ultra-Act Reveals from Figure Oh! The latest issue of the Figure-Oh collectors’ magazine has revealed a plethora of upcoming Kamen Rider SH Figuarts & Ultraman Ultra-Act items! The next S.H. Figuarts Renewal in the Shinkochu Seiho line is Kamen Rider Agito (Ground Form)! This new screen accurate figure will be a retail release in August 2015, and retails for 5400 Yen. Kamen Rider Drive’s next upgrade form, Type Dead Heat is also an August retail release and retails for 5184 Yen. This price could suggest it has parts to display it as Mach Type Dead Heat as well…. S.H. 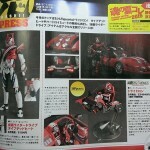 Figuarts Cruiser- the personal vehicle of Kamen Rider X! Individually the Cruiser will be released as a Tamashii Web Exclusive in August for 4869 yen. Alternatively there’s a 2-pack release with X available the same month for 8316 yen. The first Roimude S.H. Figuart is also revealed! The leader of this seasons villains, HEART is a Tamashii Web Shop exclusive priced at 5940 Yen. Last but certainly not least, September 2015 will see the release of S.H. Figuarts TRIDORON! Kamen Rider Drive’s vehicle is expertly recreated in Figuarts scale. The cockpit portion is also removeable for display on a special Tamashii Stage as well for a cutaway view of the interior. This Web Exclusive vehicle costs 24840 Yen before shipping and fees. Ultra-Act Mebius Burning Brave! Mebius’ first additional form accessed when using the Knight Brace! This special set will be released in August for 5940 yen. Ultra-Act Hunter Knight Tsurugi! This combination of Ultraman Hikari & the Vengeful people of Aarb finally makes it debut in the line! ANother Web Exclusive set for August releases, Tsurugi will retail for 5940 yen! Definitely an impressive assortment of releases! It’s time for another TokuNation.com contest/give-away! As we’ve teased on both our Facebook page as well as our @TokuNation twitter feed, we’re giving away some stuff from the Kamen Rider Gaim Arms Change toy line as well as the Lockseed toy line! This contest starts RIGHT NOW and lasts until Sunday, May 25th 2014. The contest is simple – take a picture of yourself (or have someone else do it for you) in a henshin/morphing pose (your favorite pose, or your own pose) while holding a piece of fruit! Feel free to add special effects to your picture, just please note that the entire concept of the contest is for you to be holding an actual piece of fruit (ie: don’t digitally edit a fruit in to your picture, it must be included in the picture to begin with). If you cosplay, you can get some bonus points from our judges if you include yourself in costume. Once finished, send your picture in an E-mail to contest@tokunation.com. 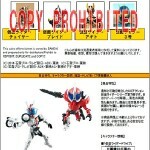 Include your full name, TokuNation.com forum name (if applicable), and Twitter handle (if applicable). Deadline to enter is Sunday, May 25th 2014. Winners to be announced on or near Sunday, June 1st 2014. The grand-prize winner will have their choice of one of two prize packages – either the package containing the Arms Change Kamen Rider Baron and Arms Change Kamen Rider Zangetsu Shin, or the package containing the Gashapon Kamen Rider Agito Lockseed and Fresh Orange Lockseed. The runner-up will receive the package the grand-prize winner did not select. YOU MUST BE 18 YEARS OR OLDER TO ENTER. CONTEST IS OPEN TO RESIDENTS WORLD-WIDE. For a full list of rules and such, simply click the discussion thread for the contest here. Questions about the contest should also be posted in that thread. Best of luck to everyone who enters!